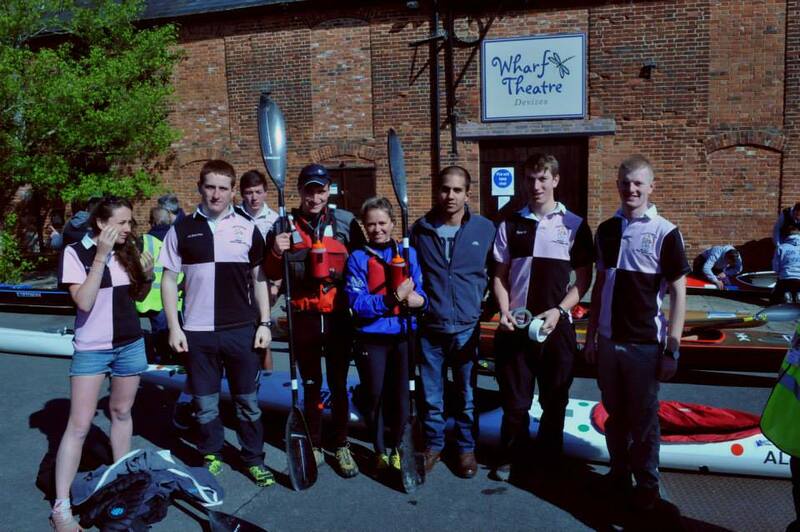 For the second year in a row the Southampton University Officer Training Corps entered a team in the Devizes to Westminster International Canoe Race, commonly referred to as ‘the DW’. 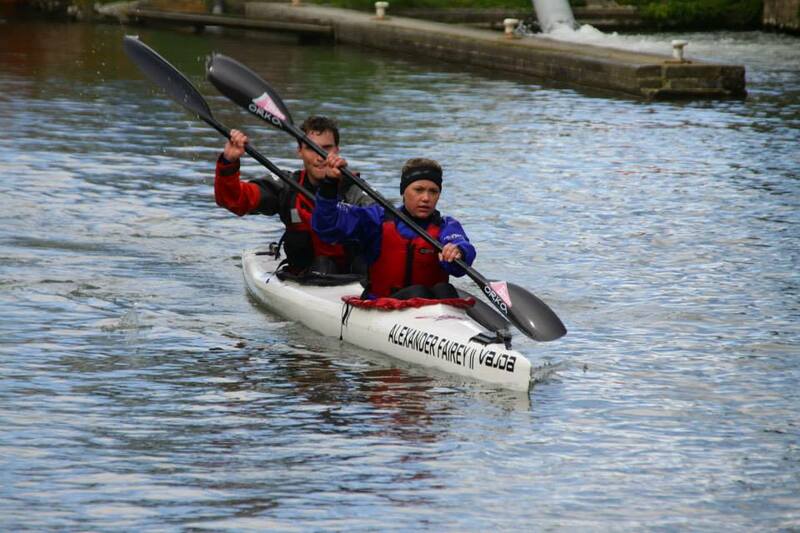 It is a gruelling 125 miles of non-stop paddling from the villages of Wiltshire to the heart of central London. The first 52 miles are along the Kennet and Avon Canal to Reading, the next 55 miles are on the River Thames to Teddington and the final 17 mile section is on the tidal portion of the Thames. There are 77 portages throughout. Our journey however, started many months previously in October when Stephanie Chase and I started training. 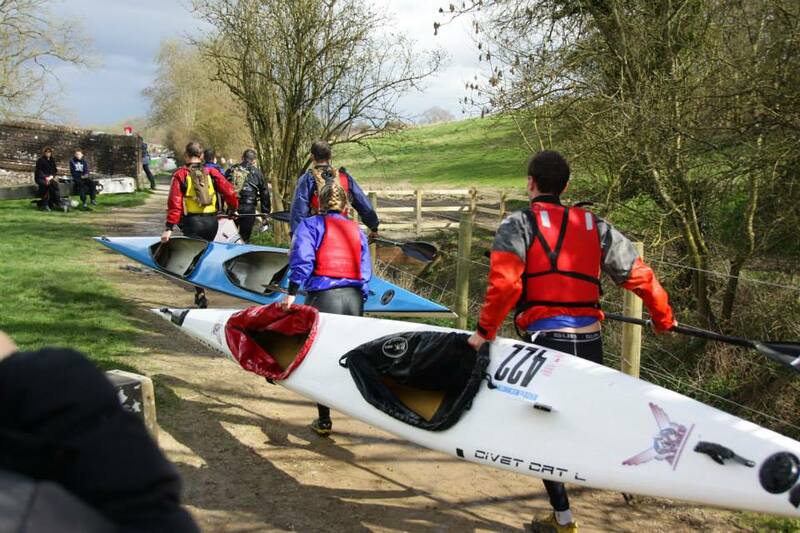 Neither of us has kayaked before so we enlisted the help of the Southampton Canoe Club to help get us to the standard needed to enter such a long and demanding race. We worked hard through the winter in cold and wet conditions to improve and slowly but surely we started getting more competent. We entered Waterside series, which is a collection of races, run fortnightly 2 months before the start of the DW that are aimed as build-up to DW. 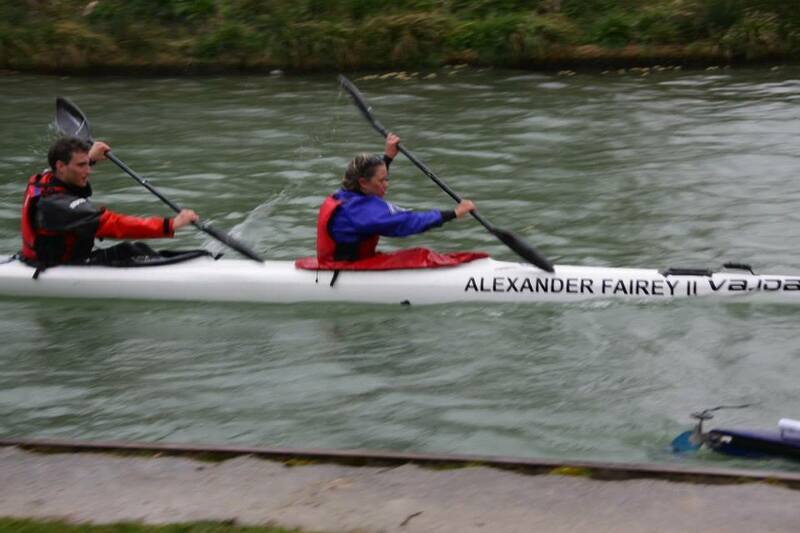 Racing got some getting used to but we rose to the challenge and came 8th out of the 15 mixed teams that entered. 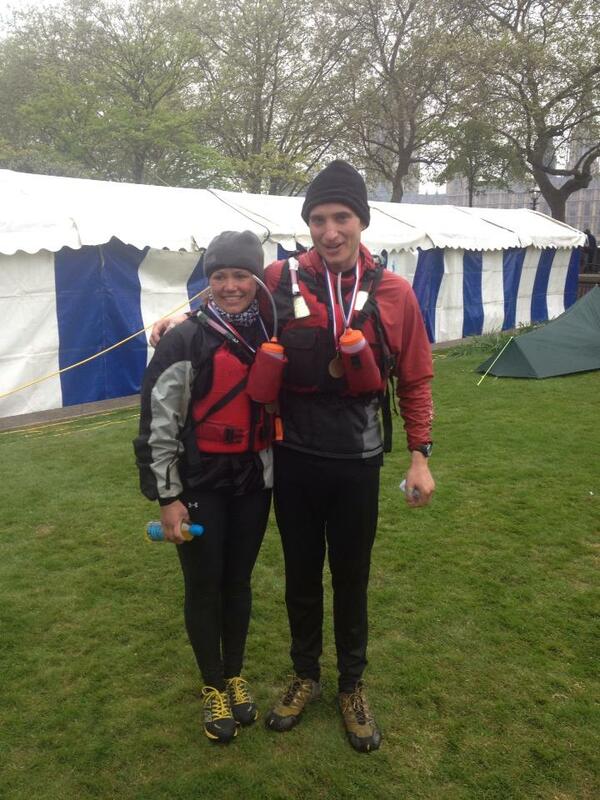 By the final waterside race we were doing 34 miles in 6 hours 19 minutes, our confidence was rising that we could complete the DW in under 24 hours, something we had only dreamed of a few months ago. We had a sense that we had done all we could. All that was left was 2 weeks of gentle paddles and carb loading before the big day. Before we knew it we were heading down to Devizes for a 10.30am start. We had near perfect conditions, sunny but not too hot. A slight headwind slowed us down a fraction but we got to Newbury (thirty-four miles in) and our first scheduled ten minute stop on time and in good spirits. Our second ten minute stop in Reading twenty miles later was also reached on time, however the sunlight had gone and the temperature dropped so we quickly changed into warmer clothes, got some hot food and headed on our way. From Reading we seemed to lose momentum, perhaps it was muscle fatigue, tiredness, the darkness or that ever present headwind but after a couple hours we were 30 minutes behind schedule and it did not look likely that we would make the 24 hour mark. However, our fantastic support crew, who had been motivating and feeding us throughout the race kept us going and minute by minute we clawed back the time we had lost and made Teddington lock and the tidal part of the Thames a few minutes ahead of time. We had factored in to reach the tidal part of the Thames one hour after high tide so the water was retreating out to sea as quickly as possible as we paddled the final 17 miles to Westminster. The pain by this point was almost unbearable but we dared not stop for fear that we may not start again. As we paddled, familiar landmarks started appearing: Battersea Power Station, the MI6 building, the London Eye and finally…Westminster Bridge, full of spectators cheering us on. We had made it, with thirteen minutes to spare. The DW is like nothing we have ever done before. It took every bit of reserve that we had to keep going and not give up. We could have easily have settled for a time over 24 hours, however we knew it was still achievable so we put everything that we had into giving it our best shot. 125 miles is a very long way but taking it section at a time, mile by mile made it manageable. Logistically, our support team had a very difficult job. We had two vehicles meeting us alternately who had to co-ordinate between themselves whilst also trying to find us along parts of the river in the middle of nowhere at night. They did a fantastic job, the DW is impossible without a very good support team. They gave us enough food, water and, most importantly, motivation on an almost half-hourly basis for 24 hours. We were the fastest reserve forces team that entered according to the provisional online results and so are set to receive the Reserve Forces Trophy. We would like to thank the Ulysses Trust for supporting this expedition.